George Wilkie was born on 22 July 1805 at Kerriemvie (or Kiniemuir), Forfarshire, Scotland, the son of Alexander and Ann Wilkie. His wife Mary, daughter of Francis and Elizabeth, was born in Canterbury, Kent, and died on 28 June 1885 at Ashfield. George Wilkie died on 30 August 1885 at the Oxford Hotel in Sydney, predeceased by his only son George in 1882, and was buried in the Independent section of Rookwood Cemetery. In 1834 George Wilkie was established as a fancy biscuit baker in Upper George Street. He was said to be the first man to import biscuit machinery to Australia. In the 1840s he was an innkeeper at the Liverpool Arms and later at the London Tavern, next door to his bakery in George Street, opposite the Police court. His brother Alexander, a farm labourer, arrived as a bounty immigrant on the Anne Milne in 1842. 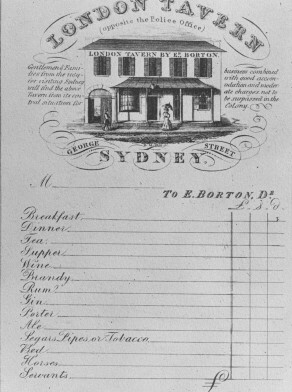 In 1847, George Wilkie bought and sold land in Waterview Street, Balmain in partnership with the merchant Henry Ferris. By 1859 he was in partnership with John Mitchell as Wilkie & Co with premises in George Street and also at 296 Castlereagh Street. In 1867 he was advertising his steam biscuit manufactory at 516 George Street and at 323 Pitt Street. Fellow Alderman John Hardie took over Wilkie’s bakery business about 1869. Wilkie was a very large man at 19 stone and he worked his way up from humble beginnings. His son George, stock and share broker, lost his fortune in the Hill End Gold Mining Company. George Wilkie was elected Councillor for Phillip Ward, 1 November 1844 to 30 October 1847 and for Macquarie Ward, 1 November 1847 to 31 October 1851.